A light citrus entree that helps protect your skin! This easy recipe is high in Omega 3 fatty acids, thanks to fresh Alaskan Cod, and also antioxidant, anti-inflammatory flavonoids, found in the citrus ingredients. The combination makes this a great dinner recipe as we head into warm weather and lots of sunshine (and the potential for skin damage). Enjoy this lovely Alaskan Cod dish and get started with your summer health protection tonight! 2. Place fish in glass or enamel ware baking dish. 3. Sprinkle sablefish with salt and pepper. 4. Combine lemon juice and oil; brush on all sides of fish. 5. 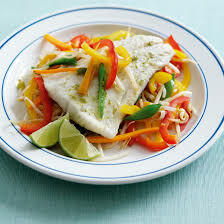 Arrange and finely diced sweet peppers and onion slices over fish; brush with remaining lemon-oil mixture. 6. Bake at 400 F for 5 minutes. 7. Arrange orange slices over onion. 8. Bake 5 to 8 minutes longer or until fish flakes easily when tested with a fork at thickest part. 9. Remove and place on individual plates. 10. Garnish each filet with fresh cilantro leaves and a squeeze of fresh lemon.